Eggnog isn't just for drinking during the holiday season. In fact, we love this thick and creamy drink baked in desserts and breakfast goods even more than we like to drink it! Even those family and friends who hate eggnog will have trouble saying no to these soft, fluffy and decadent desserts. They may become a new holiday tradition in your family. Preheat oven to 350 degrees F. Grease 3 mini loaves with nonstick cooking spray. In a large mixing bowl, whisk the flour, baking powder, salt, apple pie spice and orange zest together. In another bowl, beat the eggnog, orange juice, sugar, butter, extract and eggs together. Stir in the dried cranberries. Pour the mixture into the prepared loaf pans. Bake for about 35 to 40 minutes, until golden brown. Let cool completely. Whisk the powdered sugar, eggnog and vanilla together. Glaze each of the loaves and garnish with chopped pistachios. Preheat oven to 350 degrees F. Grease a standard 9 x 5-inch loaf pan with nonstick cooking spray. In a large bowl, mix the pound cake mix, eggnog, eggs and vanilla. Beat until smooth. Pour mixture into the prepared loaf pan. Bake for about 1 hour, or until a toothpick inserted in the middle comes out clean. Let cool slightly. While it cools, melt chocolate in the microwave, stirring every 30 seconds. Whisk in the butter and glaze and stir to mix. 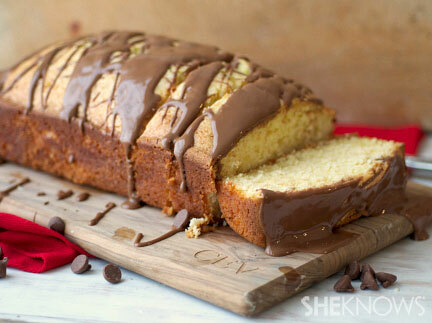 Drizzle pound cake with chocolate and serve! Preheat oven to 350 degrees F. Grease an 8 x 8-inch square cake pan with nonstick cooking spray. In a large bowl, beat the chocolate cake mix, milk chocolate, eggnog, water, eggs, vanilla and vegetable oil together. Pour the mixture into the prepared cake pan and bake for about 35 to 40 minutes, or until soft and fluffy. Let cool. While cake cools, prepare the frosting. 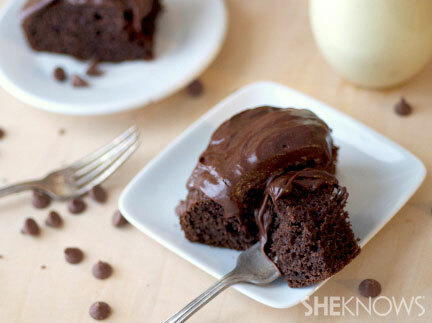 Melt the chocolate chips in the microwave until melted, about 60 seconds. Cream the butter, chocolate, espresso, vanilla and powdered sugar together. Frost the cake and cut into thick slices.